Kyle Singler of the National Champion Duke Blue Devils has announced he will return for his senior year at Duke ending speculation that the junior forward would enter his name in the NBA draft. 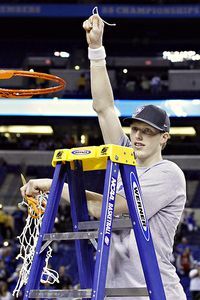 Singler, who was the Most Outstanding Player (MOP) of the Final Four said, "I can get better. I want to be the best player when I do make that step and I think I can improve here to do that." Elite Hoops is sure that attending classes at Duke and playing for 4-time NCAA Champion and Head Coach of the USA Olympic team can't hurt Singler's chances of improving. As John Wooden used to say, "Don't measure yourself by what you have accomplished, but by what you should have accomplished with your ability." To read more on Singler's decision to continue his basketball career at Duke click HERE.